Directions: From the city of Bishop in California, drive 21 miles north on US395 and then take a left on Rock Creek Road. Follow Rock Creek Road for about 10 miles to a large parking lot. The road ends here and this is the Little Lake Valley trailhead of the John Muir Wilderness. 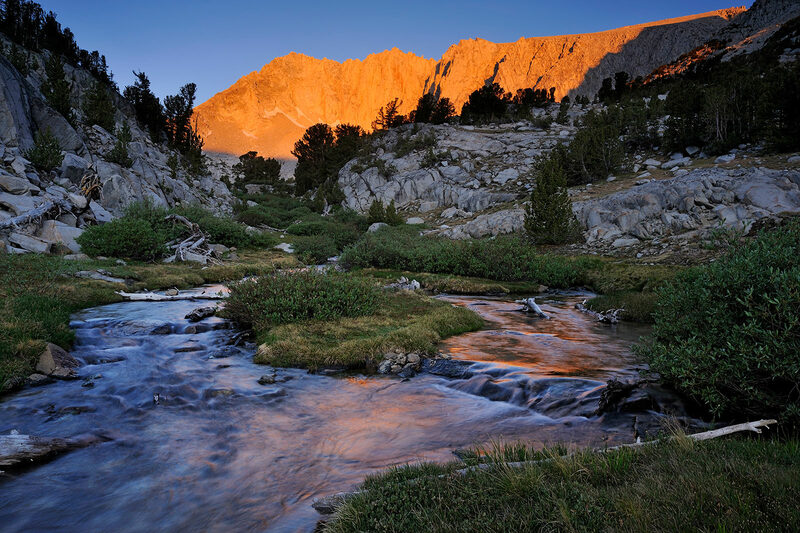 Take the Little Lakes Valley trail for 0.5 miles and bear right at the fork on the Mono Pass trail. Follow Mono Pass trail for about 1.5 miles to reach another fork. 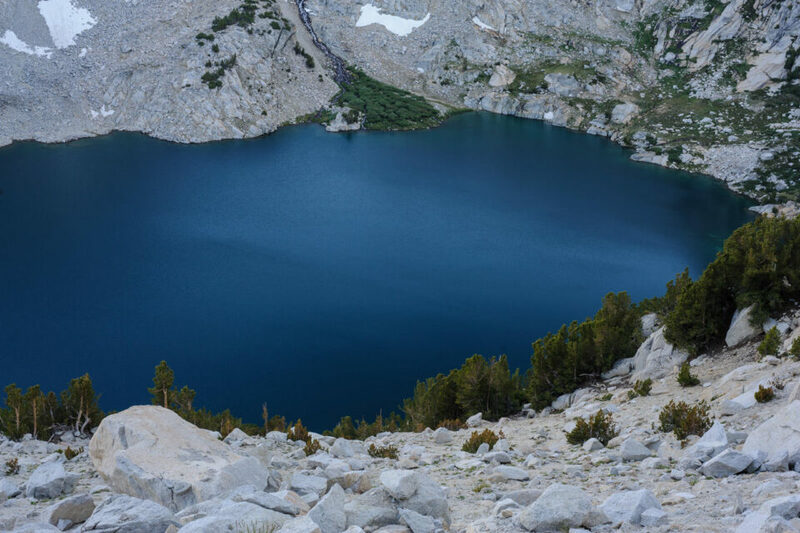 At this juncture, the Ruby Lake trail on the left takes you to Ruby Lake in 0.2 miles. Ruby Creek flows through the picturesque meadow here. Also, the trail to the right climbs to Mono Pass (~ 12000 feet) is further 1.5 miles. Please note that this is moderate to strenuous hike due to the elevation gain and overall altitude of the region (> 10000 feet). I first discovered the Ruby Lake/Creek area during a day hike and realized that it will be best photographed at dawn when the peaks glow in morning light with Ruby Creek serving as a foreground. So, I decided to backpack here and camp overnight the next year. 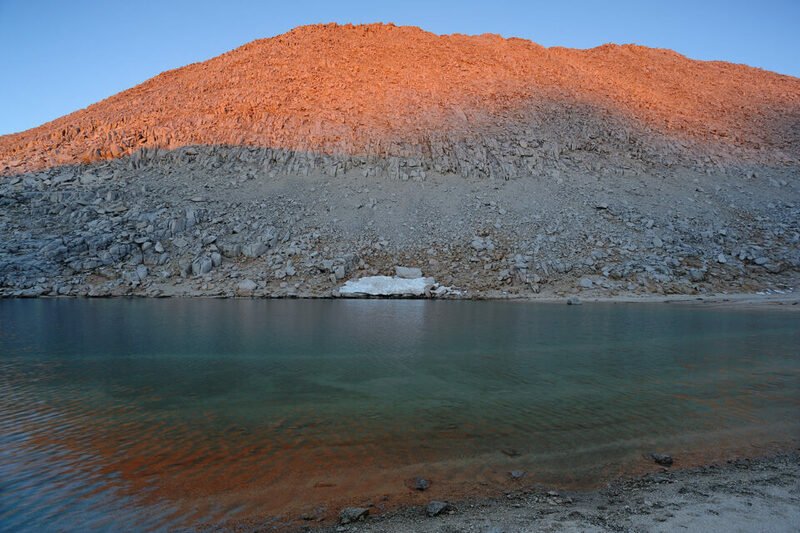 The idea was to set up a base camp by late afternoon near Ruby Lake followed by a day hike to Mono Pass as the light there is best in the evening hours. Then photograph sunrise as envisioned next morning. As a bonus it was close to a full moon during my trip and I could squeeze in about an hour of night photography while we cooked dinner and made hot chocolate after coming back from Mono Pass. 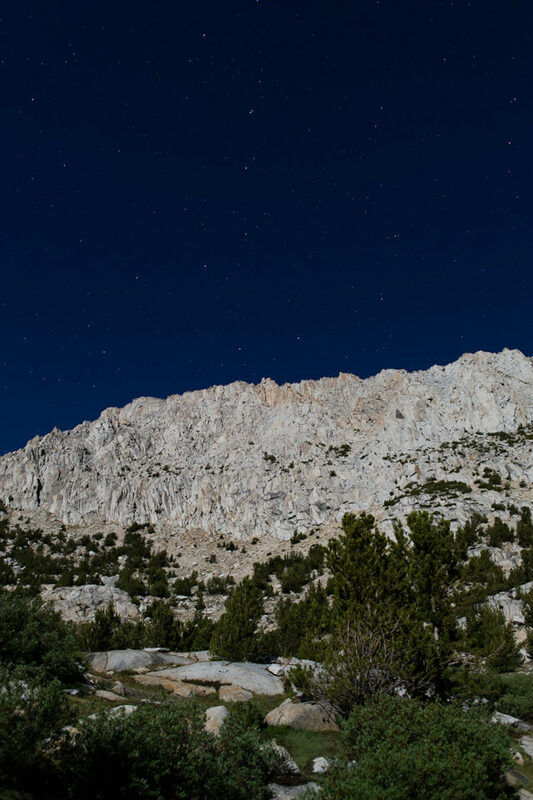 In the month of July, the Big Dipper aligns with Mt. Starr, which towers over Ruby Creek meadow in the North. 1. To camp here overnight, you need a wilderness permit, which is issued at the Mono Lake Visitor Center in Lee Vining. Also, since this is bear country, a bear canister is a must, which is also available from the same visitor center. 2. The hike starts from 9500 feet and goes above 12000 feet. 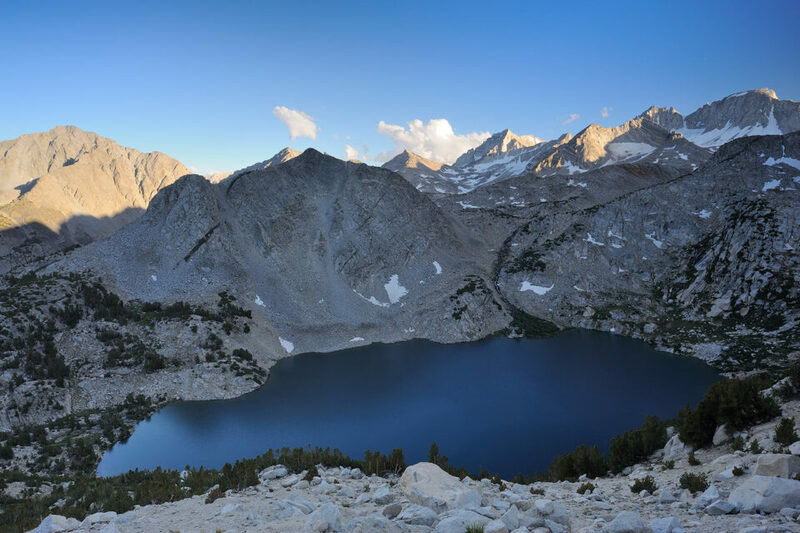 I recommend getting acclimatized to the thin air of the high country by spending a day around Tuolumne Meadows or Mammoth Lakes, both of which are not that far from here. 3. A wide angle lens is required to capture the granite peaks over Ruby Lake as you are quite close to them. I used a 24 mm f/2.8 ai and the very sharp 20 mm f/4 ai lenses here. For night photography a fast prime works best. Essentially one can carry an 18-35 mm zoom with 28 mm f/1.8 prime to be covered. 4. To get a few tight compositions, I recommend carrying a zoom lens covering 70-200mm range. During backpacking, I usually carry a 75-150mm f/3.5 lens, which is exceptional at f/8 and f/11. 5. A tripod is must for slow shutter speeds, needed either due to small apertures for DOF, capturing motion blur in water and night photography. 6. Use a polarizer to enhance reflections in lakes or creeks. 7. Use base ISO as much as possible to get maximum dynamic range. Also, graduated ND filters may prove useful to open up the shadows while holding exposure in the lit mountain peaks. 8. Best time: dawn to early morning for Ruby Creek and Lake. 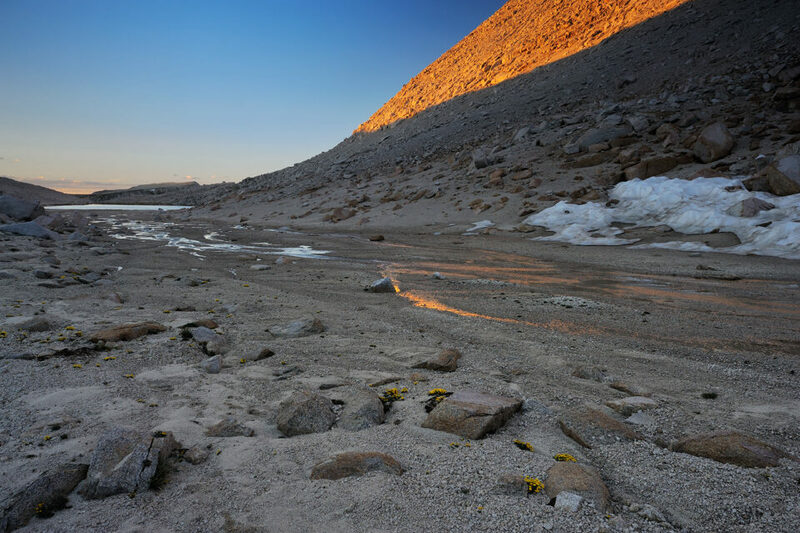 Late afternoon to sunset for Mono Pass.